A local restaurant in Sneinton is to host networking business lunches with business owners and Local Enterprise Partnerships. The lunches will be hosted by restaurant owner Iftikhar Ahmed at his restaurant Desi Grill Pri Pri Chicken on Monday 8 June and Tuesday 9 June, at 11:30am- 1:30pm for both days. 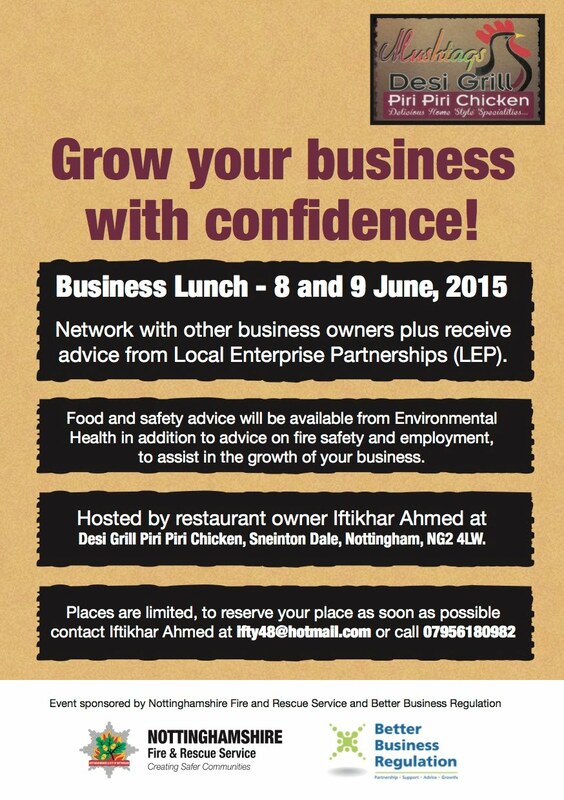 Iftikhar said “The concept of the business lunches is an excellent initiative for the community. I now have a greater understanding of the regulations I have to follow in order to keep my business successful. I know that other business owners within the Pakistani community often feel intimidated by business legislation and regulatory bodies, and are not aware of the support and advice they can actually receive. Working with Nottinghamshire Fire and Rescue Service has opened my eyes to see this and the support I have received has been very beneficial. Fire Protection Officers at Nottinghamshire Fire and Rescue Service (NFRS) have seen a rise in the amount of prohibition notices being issued due to unsafe practices in restaurants and fast food outlets in Black and Minority Ethnic (BME) and emerging communities. This is partly due to language being a barrier to understanding safe business practice. Through research the Fire Protection Officers have identified hotspots within the county, and the aim of these lunches will be to educate business owners to create safe environments which embrace the culture of fire safety awareness. Paul Cooper, organiser of the event and the Business Education Advocate for NFRS said: “In order for us to engage with businesses in our community we have worked very closely with members of the Pakistani community to build a sense of trust and understanding. We want business owners to feel comfortable in coming along to the business lunches so they can learn the requirements regarding business premises from a Fire Protection perspective and have an understanding of any regulatory growth issues. Paul Dales, Nottingham City Council’s Food and Health & Safety Manager, said: “This is a great way for my team to meet informally with business owners and advise them on how to comply with the various regulations in the easiest and most cost effective way. For further information, please contact: Chanice Jenkins, Communications Officer, Nottinghamshire Fire and Rescue Service, on 0115 967 5914, 07967 690724, or email Chanice.Jenkins@notts-fire.gov.uk . For further advice on fire safety, contact your local fire station or visit www.notts-fire.gov.uk or http://www.facebook.com/firekills .